Go home Pope, you're drunk. I honestly thought it would be a video of shortduck's mom. Nah, Pope couldn't get drunk or high enough to want my Mom. Or really anyone for that matter. Unless you want to hear about Adam Lambert 24/7 and just how 'great' he is. At least pope doesn't have sticky inflatable anime dolls lying around his room for his mom to clean. In case you didn't know, that was directed at you Tall! I actually don't own one of those. But what I find more creepy are the bedsheets some of these guys own... which also for the record, be surprised, I don't own. bedsheets? What did I miss? Your image is a pile of fail. They're probably bedsheets with tentacles "attacking" you. Hey Pope I just hired her as a lab tech. I wondered about that time gap between Pizza Hut and Footlocker in her resume. BTW, she's blonde now. she is quite fit, and has the body type I like, but she can't dance. Oh that dumb french chick they used to model one of the really bad /dance animations in world of warcraft. Looks like Image Shack deleted my photo, so here it is again! I can find more creepy stuff for you guys if you want, will dedicate a whole thread to it. 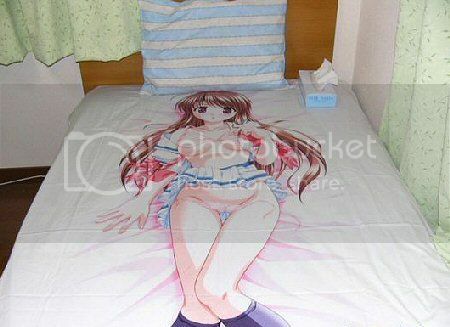 If they put better images on the bed it's actually a cool concept, would be hilarious if it was a giant mouth or spikes. She still is my fave ! We can do that by looking through your ebay feedback. Omg i love her ! Just got done watching her again in long time . She still is my dream girl !